Before The Murder at Haversham Manor begins, the newly elected president of Cornley Polytechnic Drama Society, Chris Bean, appears on stage to welcome the audience. Bean is also the director of the play and ensures us that this will be the most impressive performance ever put on by this thespian group. However, when this 1920's themed whodunnit is a play within a play called The Play That Goes Wrong, well...it's fair to say that nothing goes according to plan, but the show must go on. And so it does, with many laughs along the way. 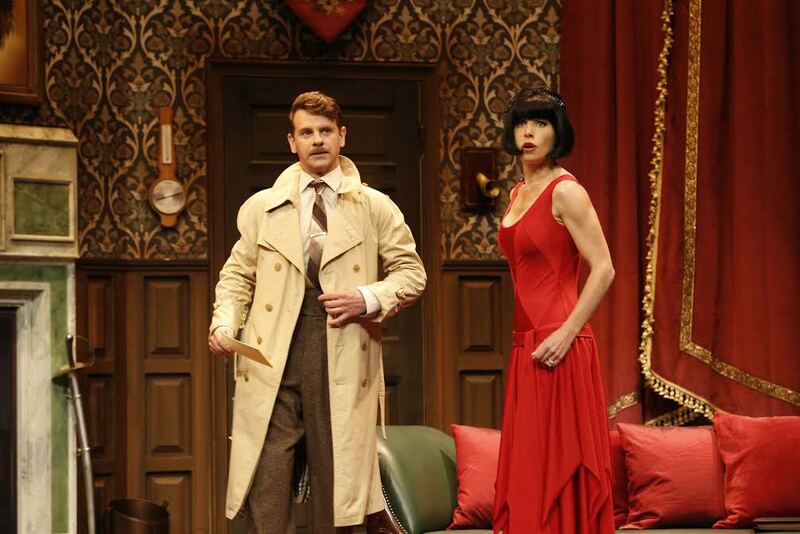 While The Murder at Haversham Manor plays out like an Agatha Christie-like plot, The Play That Goes Wrong reveals what happens on the Drama Society stage's as the actors contend with missing items, breaking props, forgotten lines and unconscious colleagues. While comparisons to the classic Noises Off are undeniable, there is still a freshness to the performance with the fun and laughs remaining constant, even if there are a handful of times when they get become slightly repetitive or milked too much. The entire cast embrace their characters, who in turn embrace their characters, and ultimately deliver near perfect comedy timing. They are more than up to the challenge when it comes to meeting the physical demands of the production with high energy and dedication, while under the brilliant eye of Australian cast director Sean Turner. Darcy Brown (who plays Max Bennett who in turn plays Cecil Haversham and Arthur the Gardener), is particularly joyful to watch especially when he's giving his charades-like performance as he speaks his lines. Brooke Satchwell as Sandra, plays the grieving fiancée Florence Colleymoore - as does Tammy Weller, who also plays the stage manager Annie Twilloil. Both are energetic with Satchwell (or is that Sandra) playing the intentional melodramatics of Florence perfectly and Twilloil's transformation from shy stage manager to determined and ferocious actor is side-splitting. If all this isn't confusing enough, then you're already ahead of the pack! I initially attempted to hear every word that was being said, but with the riotous laughter that filled the Comedy Theatre, it was not always possible. Fortunately, it's not simply the story that matters here. While Henry Lewis, Jonathan Sayer and Henry Shields have written a fun and surprisingly intelligent double narrative (for what we are watching), it is the visual aesthetics of Nigel Hook's impressive set design brimming with surprises and "danger" at every turn that reels you in. 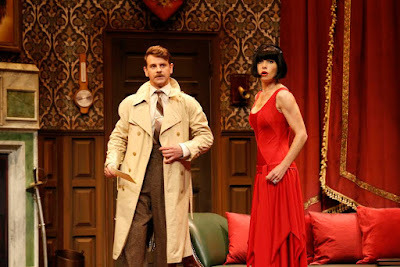 While there is not much good that can be said about The Murder at Haversham Manor, it's a completely different story for The Play That Goes Wrong. It's a stylishly comic production that exists simply for laughs, and nothing but laughs; and from beginning to end - especially in the uproarious second act - there are plenty to be had. While everything that can go wrong goes wrong in the play within the play, the play itself hits all the right marks. *Original review appeared on Theatre Press on 28 February 2017.